Helen Thornton travels mainly within the North of England. 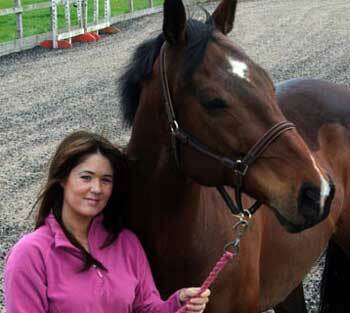 Her ambition is to be the equine physical therapist for leading horses of all disciplines. Distance is not usually a problem. The range of techniques used by Helen Thornton are tailored to each individual, and include sports massage (ITEC Dip trained via Mary Bromley), Bowen EBT, manipulation. Pre & post competition treatment to promote full range of movement, relaxation, rehabilitation and to enhance performance. Helen covers all the UK, with quicker availability around Lincolnshire and Yorkshire. NB VET DETAILS REQUIRED – IT IS ILLEGAL FOR A THERAPIST TO TREAT A HORSE WITHOUT VET APPROVAL – IF SOMEONE IS NOT QUALIFIED YOUR HORSE HAS NO PROTECTION.